Bursitis is an inflammation of the bursa. A bursa is a small flat sac lined with synovial fluid which reduces friction that occur usually between tendons and bones. 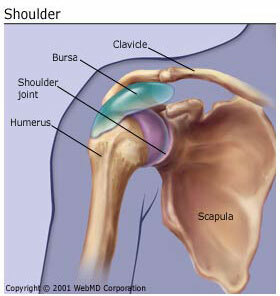 Bursitis is caused by overuse of structures (joints) that surround a bursa. The excessive friction/rubbing of the tendon over the bursa causes inflammation of the bursa walls. Bursitis is often secondary to another condition such as tendinitis. Treatment will focus on reducing the major symptoms of Bursitis, namely pain swelling and inflammation. Reducing compression on the affected bursa will reduce symptoms. Depending on the stage of the Bursitis whether acute or chronic different techniques are used to help reduce the swelling pain and inflammation. If you have any questions about Bursitis contact our staff at Dynamic Physiotherapy.